6 Baywatch Drive – where upscale chic meets the beach! Enter into a colorful retreat with fine custom details. Step onto the back porch to an expansive view of the Intracoastal Waterway, marshlands, Holden Beach, and the great Atlantic. Bring your binoculars for wildlife observation, and let the tranquility of this location wash over you. On the main level, the split-bedroom floorplan offers privacy and comfort. The king-bedded retreat has a sliding glass door to the porch and an en suite bathroom with a pampering deep soaking tub, separate shower, and double-sink vanity. The other two bedrooms on this level include a double bedded room with a private bathroom; and the twin-bedded room, next to a full bathroom, has sliding glass doors to the porch. A den/living room situated between the bedroom wings completes this level. On the upper level there is an identical king-bedded room with the same special appointments. The open floor plan on the upper level lets everyone join the fun of preparing meals - or just keep the cook company while sitting at the raised bar counter or in the adjacent great room and dining areas. There is a wet bar in the great room, complete with a wine cooler for toasting good times with family and friends. A centerpiece wall of windows brings the panoramic view indoors. The upper level also has a laundry room and powder room. Outside features include front and back porches with rocking chairs, rattan furniture and Adirondack chairs – perfect for sunrise and sunset seating. On the ground level there is a covered area with a table and chairs for enjoying al fresco dining and impromptu picnics near the charcoal grill. There is also an oversized enclosed outdoor shower with a dressing area. 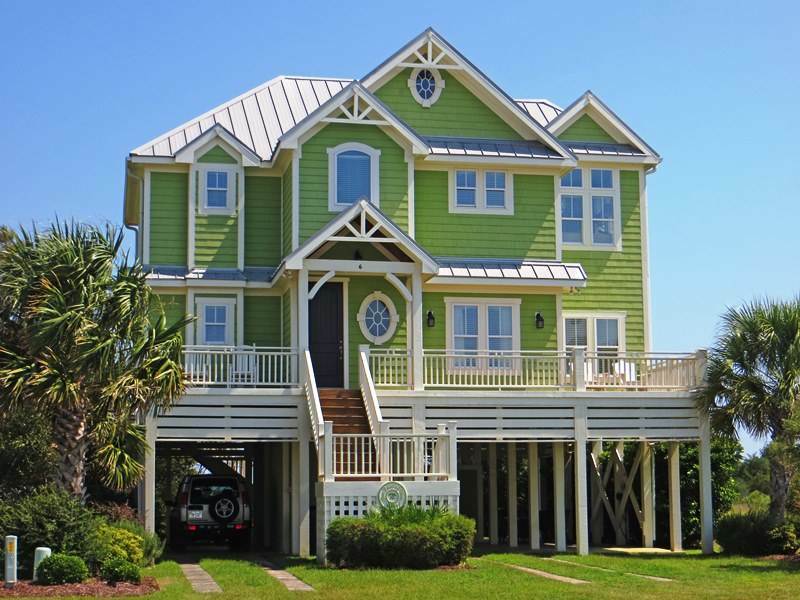 The home is situated at the east end of Ocean Isle Beach in the Maritime Place community where guests have exclusive access to a community pool, a gazebo and a dock for fishing. Boaters can load and unload at the marina’s floating slips during high tide. Boats may not be docked overnight, though 6 Baywatch has ample room to park a boat trailer, plus four vehicles. Beach access is less than a half-mile away, at the end of Fourth Street.